Welcome to the Morecambe Brass Band Association (Charity Registration No. 1133214). OUR NEXT CONCERT….. Happy Mount Park, Morecambe, 2:30 19th May 2019, Our first open air concert for 2019. Following the retirement of Steve Simpson who has been conducting the band for the last 4 years we are now looking for a new MD/conductor. We are a friendly band with a sensible approach to family, work & band commitment and rehearse on Monday & Thursday evenings and perform various concerts and at various events throughout the year. The band is situated just 6 miles from Lancaster University and 10 minutes from the M6 and travelling expenses can be agreed. New players are always welcomed, again please contact our secretary for further details. 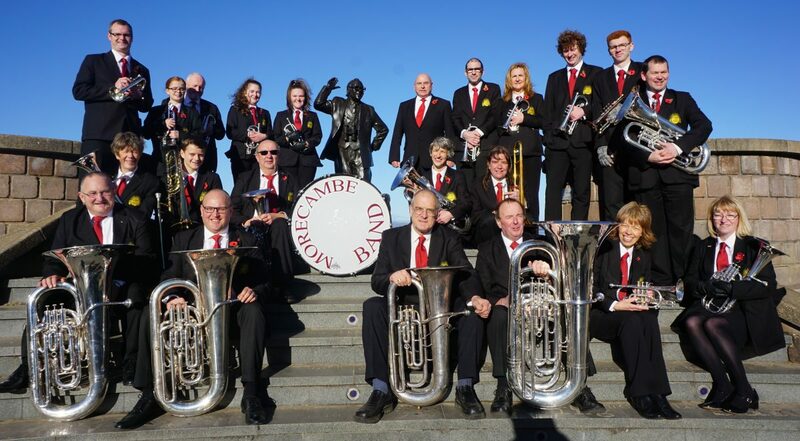 The Morecambe Brass Band Association is based in North Lancashire, in the traditional seaside town of Morecambe. The Association consists of two bands catering for all musical abilities and interests, from beginner upwards to seasoned professional. The bands play regularly in local concerts and music festivals across Lancashire and Cumbria. UNIVERSITY STUDENTS… Are you coming to the University of Cumbria (Lancaster campus) or to the Lancaster University and want to continue playing whilst away from your home band? Then please consider the Morecambe band, transport can be arranged from Lancaster to Morecambe as we have a few players that live in Lancaster, or, travelling expenses can be agreed, you do not have to commit to two practices a week, please contact our secretary if interested. PLEASE NOTE…. The Bay Brass Band at present has been amalgamated into the main Morecambe Brass Band with rehearsals on Mondays and Thursdays. We hope that sometime in the future we will run the Bay Brass again. Please feel free to look around the website for information on future music events and how to join the band if you are interested in playing. Our rehearsal room is situated near to Morecambe Police Station. Please contact our secretary if you would like any further information. If you’d like to book any of our bands for an event, sponsor a concert or programme, please contact our secretary.